When I was doing my graduate studies one our of history teachers taught us to study the content of a book when you take a new book in your hand and before you read it. Note, that I wrote study the content, not just read the content. In fact, one of the final exam questions would be the content of the books, which we had used during that semester. 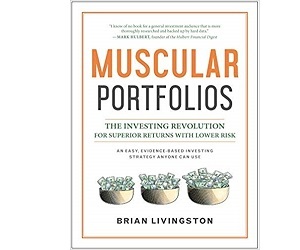 So the first thing I did, when I took Brian Livingston's Muscular Portfolios: The investing Revolution For Superior Returns With Lower Risk ISBN-13: 9781946885388, is to study the content. And it's impressive. The books is so thoroughly written that it's impossible to cover everything in one review. It's very handy, helpful and useful not only for investing professionals, but also for the beginners. If you are a beginner, not looking for a quick buck and don't have the time to learn everything about investing Muscular Portfolios is for you because the book will enable you to gain a solid plan and confidently start investing within an hour after you finish reading it. One thing that I particularly find interesting about Muscular Portfolios is that almost every chapter is backed by historical facts and they all are presented in easy-to-understand narratives. Reading Muscular Portfolios you will learn at least 3 things. How to get market-like returns with no fear of crashes. The most profitable way to use the newest low-cost index funds. How 21st-century science demonstrates greater gains with lower risk. The chapters of the book are groups in sections. Then the author talks about different types of portfolios calling the investors to find the investment portfolio that's just right for them. He discusses three types of portfolios called Mama Bear, Papa Bear and Baby bear portfolios. You have to read the book to understand them in details. In the following sections the author discusses some principles such as Compounding, Diversification and Momentum and teaches the investors how to adapt to Wall Street so that rogue Wall Street banks don't tap your nest egg. He warns that there are no experts who can predict the future. The book shows that investors don't need indicators that don't really indicate and that investors should defeat behavioral biases and become their own investment advisers. Section F may be uniquely interesting part of the book as it talks about the Implementation. Livingston advises to use bargain brokerages, but warns to watch out for hidden fees. He urges to rebalance your portfolio without getting all obsessive about it and reduce the IRS tax bite with 401(k)s, IRAs, and Roths. Then he shows how to maximize your Social Security benefits and avoid the "Tax Torpedo." You need to find a safe withdrawal rate to last you the rest of your life. For the author the dynamic portfolio model is the index Investing Revolution. You don't have to take more risk in order to get more gain. Some models, such as MPT, CAMP and ENH, have already lost their usefulness. "Megatrends in the 21st century have converged to form the Dynamic Portfolio Model: remain 100% invested at all times in the three asset classes with the strongest momentum," concludes the author. Investors need to remember that past efficient frontiers don't predict future efficient frontiers. Risk is not always rewarded. Individual investors don't have to take a greater risk of loss to achieve a higher return. Each title under chapters has a special section called "Key Concept," which on a yellow background in one sentence highlight the key concept that the author wants to remain with the reader. Overall this is a very good book to have in your shelf. The book has a companion website called Muscular Portfolios, with daily portfolio tracking.